A. Why didn’t I think of that? B. How come nobody ever thought of that before? Well, those are the thoughts that hit me when I opened the newspaper this morning and was greeted by a surprisingly tasty looking Waffle Taco that Taco Bell is launching to anchor their new breakfast menu (formerly known as First Meal at their restaurants). Now to be honest, for over a decade (and still to this day) have felt that ascribing the restaurant label to a Taco Bell was quite generous, and always wondered why people go to Taco Bell when there are so many good Taquerias and Taco Trucks around. Sorry, Taco Bell. But recently they have surprisingly been one of the more innovative fast food players. In a previous post – Food Innovation Sighting – Doritos Tacos – I took to blogging about their previous food innovation, the Doritos Locos Taco, which initially came in the Nacho Cheese variety and was then followed by the Cool Ranch one. Frito Lay subsequently then made the taco shells available in grocery stores. Not a bad little piece of supplier innovation if you ask me. 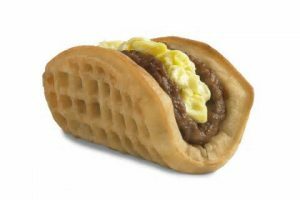 Now, Taco Bell is following up their Doritos Locos Taco success with the Waffle Taco. A waffle wrapped around scrambled eggs and either sausage or bacon (with a side of maple syrup). I have to say the picture here looks pretty tasty, but of course I know it won’t look like this in reality when someone orders it (see False Advertising? and follow the link in the article). What potential innovation ideas are so close to us and should be so obvious to us, that if they were a land mine, we would probably blow ourselves up because we’re not seeing them? So, keep looking for those obvious innovations that you’re missing now and keep innovating! P.S. I’m sure some enterprising restaurateur out there thought of the waffle taco decades ago, and that makes another point about innovation – that many flashes of brilliance and successful innovations are triggered by seeing something when you’re out in your environment (and why inspiration sits at the core of the Eight I’s of Infinite Innovation). This entry was posted in Innovation and tagged Doritos, doritos locos tacos, Fast Food, food, waffle tacos, waffles. Bookmark the permalink.